Use this form to generate the VIM (Video In Motion) login-code to gain write-access to any MMI 3G head unit to enable TV/DVD-playback at all vehicle speeds. Click here for more information. Looking for a MMI 2G login-code? See here. Select "Advanced ID - 1A"
Submit the value from the "Serial number" field in the form below. If there's more than one serial number, use the first one! Select "Security Access - 16"
Press "Do It!". If you receive a "code not valid" message try the alternative code. If neither code works it's likely that your control module doesn't support VIM adaptation. 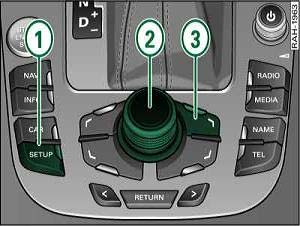 Restart the MMI: Press and hold down the function keys 1 (SETUP), the control button 2 and the control key at the top right 3 simultaneously until the MMI system shuts down. Release keys -> MMI system reboots. If this login-code generator worked for you, please leave a comment and include the car model and model year, thanks! If you're using a VAS 505x use channel 001 to get the serial number (first field) and remove the leading zero from the generated login-code (4 digits instead of 5). Click here to translate this page to German or any other supported language. And by the way, did you know that the buttons in VAG-COM/VCDS use the same numbers in every language, i.e. 10 for Adaptation, 1A for Advanced ID. Many thanks go out to Flibbi for providing the correct adaptation channel for the MMI 3G! Warning/Disclaimer: Do not watch and drive! It may even be illegal in your country to watch video/TV while the car is moving! This is for experimental purposes only.